An acclaimed James Cook University researcher has warned of an ‘explosive era’ of infrastructure expansion across the globe, calling for a new approach to protect vulnerable ecosystems. Distinguished Research Professor William Laurance is the lead author of the study, which has been published in the journal, Current Biology. 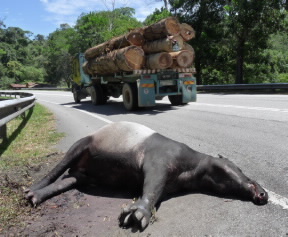 Road kill: "A road-killed tapir in Malaysia" (©WWF-Malaysia/Lau Ching Fong). An acclaimed James Cook University researcher has warned of an ‘explosive era’ of infrastructure expansion across the globe, calling for a new approach to protect vulnerable ecosystems. Distinguished Research Professor William Laurance is the lead author of the study, which has been published in the journal, Current Biology. He said the world is being developed at an unprecedented pace, which comes at a great cost to critical habitats and wildlife. “We are living in the most explosive era of infrastructure expansion in human history,” said Prof Laurance. The team of scientists, which has contributed to the paper, argue nine issues must be addressed to limit the environmental impacts of the ongoing global expansion of roads, energy and infrastructure projects. “Nine-tenths of these new roads will be in developing nations, which sustain many of the planet’s most biologically rich and environmentally important ecosystems,” said Prof Laurance. 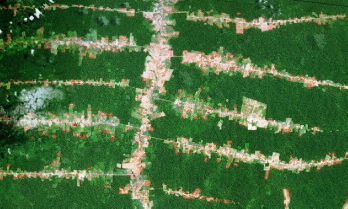 Amazon roads: "In the Amazon, 95% of all deforestation occurs within 5 kilometers of a road" (© Google Earth). Study co-author, U.S. ecologist and former advisor to three U.S. Presidents, Thomas Lovejoy said governments around the world need to protect vulnerable environments. "The challenge will be to design and manage infrastructure in ways that respect the natural environment from which we all benefit," Professor Lovejoy said. The study is being used by scores of world-leading scientists, environmental activists and celebrities as part of a campaign to lobby the G20, which represents the 20 wealthiest nations on Earth. The G20 leaders announced in November a scheme to invest US$60-70 trillion in new infrastructure globally by 2030. Prof Laurance said this would more than double the net investment in new roads, dams, power lines, gas lines, and other energy infrastructure globally. “Unless managed with extreme care, it would be an environmental disaster wrapped in a catastrophe,” he said. The researchers emphasise that the threat to the environment is even more serious when illegal development activities are considered, in addition to those that are officially sanctioned. In the Brazilian Amazon, for instance, there are three times more illegal roads than there are legal roads. “Roads that penetrate into wilderness areas often have particularly serious effects, often opening a Pandora’s Box of environmental problems—such as promoting habitat conversion and fragmentation, poaching, illegal mining, wildfires, and land speculation,” said Professor Laurance. Work to keep intact wilderness areas road-free according to the maxim ‘avoid the first cut.’ Narrow cuts through forested areas have a tendency to grow. Recognise that efforts to pave existing roads are not without consequences. Paved roads mean greater, year-round access to wilderness areas and faster speeds that put wildlife at greater risk. Secondary effects of projects, including energy and mining efforts, are “often worse than the project itself.” Environmental impact assessments must include direct and indirect effects in their cost-benefit analyses. Greater emphasis should be placed on so-called ‘offshore’ projects, which might be deep in wilderness areas but don’t require the construction of new road networks. Instead, workers use helicopters or traverse rivers to reach the construction site. Lenders and other involved parties should get involved in projects early when plans can be more easily shaped or cancelled altogether. Better tools are needed to enable financial institutions and others to more effectively evaluate the environmental and social consequences of development projects. Financial institutions must also enlist those with the appropriate environmental and social expertise on their teams. Seek greater involvement from non-governmental organisations and the public, especially those who stand to be impacted directly. Prof Laurance said it’s vital that those involved in evaluating, promoting, and funding such projects engage not just with those who stand to gain from such projects, but also with those who stand to lose. Laurance, William F., Anna Peletier-Jellema, Bart Geenen, Harko Koster, Pita Verweij, Pitou Van Dijck, Thomas E. Lovejoy, Judith Schleicher, and Marijke Van Kuijk. 2015. Reducing the global environmental impacts of rapid infrastructure expansion. Current Biology, DOI:10.1016/j.cub.2015.02.050.